QuadCatt is the 3rd generation of the original “Argonaut”. It is the lightest, strongest, best built member of the waterborne Cats. It is a truly fitting design for celebrating the first 30 years of the multi-tube cataraft revolution. Read user comments about the QuadCatt posted here on Alaska Outdoors Supersite. After 25 years of proven performance, the latest evolution of the Argonaut and Cougar cataraft. The best double-tube cataraft design on the water, the Quadcatt offers an ideal combination of maximum load capacity and ‘Catt quickness. Its extreme maneuverability and stability make it the favorite for fly-in river expeditions, Class 5 or Grade 5 whitewater boaters, and Grand Canyon-sized trips. Made with pride and with the highest quality materials and workmanship, these boats are highly adaptable, designed to withstand the punishment of years of commercial and private usage on the world’s most demanding rivers. I built my first multi-tube cataraft using 2 Seasled pontoons in 1981. The advantages of the multi-tube catarafts over self bailing rafts and single tube catarafts was immediately apparent and we soon began making “Top to Bottom” first descents of “Kayak Only” rivers including “The Numbers”, “Pine Creek”, and the “Animas”. The adopted Seasled tubes created a remarkable Cat with the three tubes per side but its waterline was too long [slowed down the pivoting] and it had too shallow of a bow rise and a short pencil point stern, no uplift. The “Perfect World” cataraft would have a short waterline for lightening fast spins, symmetrical bow and stern uplifts for riding up and over waves [not punching through them], two identical tubes per side so that it would have half the draft of a single tube cataraft [this greatly enhances spin / pivoting speed], have a low profile, smaller diameter tubes [provides a significant increase in dynamic stability], be light enough to dance down Class 5+ runs and have enough displacement to easily support a month long river expedition adventure. If you want to run world-class rivers, you need to have world class equipment. The original double tube cataraft was designed and developed in 1984 when I launched my first inflatable boat company, “Argonaut”. It was the only model that we produced and the river community knew it as the “Argonaut Cataraft”. In those early years we were running several NW Canada and Alaska rivers and needed catarafts with modular frames that could be flown into headwaters in a Cessna on floats and carry gear for a fortnight. The double tube design gave the “Argonaut” wild water performance that was a quantum leap beyond conventional self bailing rafts and single tube catarafts. The “Argonaut” first descents on Class 5+ rivers include the “North Fork of the Payette” Smiths Ferry to Banks, the “Tumwater of the Wenatchee” including the dam pour over, the “South Salmon” top to bottom, and the upper “South Clearwater”. In 1989 I took on 2 partners and the company name was changed to “Argonaut Inflatable Research and Engineering”. The acronym “AIRE” is familiar to nearly everyone who has ever owned a Cat, Raft or IK. The “AIRE” version of the “Argonaut” was christened the “Cougar” and it was the first of a very large family of Catarafts. The “Cougar” was the first “double membrane” Cat that was constructed with a PVC outer shell and a polyurethane [PU] inner aircell. I redesigned the cone – cylinder – cone shape of the original “Argonaut” to be a seamless cylinder ending in a diminishing compound, complex rising cone. The seamless transition from cylinder to cone created a faster laminar flow design and doubled the displacement of the cone ends without adding to the overall length or increasing the tube diameter. In 1996 I started my 3rd inflatable watercraft company, “Oceanid” which designs, develops and distributes water rescue craft specifically for Emergency First Responders including fire departments, sheriff, US Coast Guard, SAR groups and dive rescue teams. 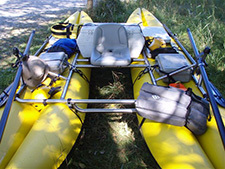 AIRE quit producing the “Cougar” a decade ago which prompted many queries to me from river runners who wanted to find double tube catarafts in a single tube cataraft world. QUADCATT Inc. Recreational Rafting Equipment. Copyright © 2011 All rights reserved.